Created for impatient Skunk Cannabis lovers, these autoflowering Super Skunk seeds are very quick to grow, once germinated and growing, these seeds will grow and flower simultaneously, reaching maturity in under eight weeks, regardless of the number of light hours they receive.Super Skunk Cannabis was originally developed for Skunk lovers, and is one of the most famous Cannabis strains in the world. Super Skunk Auto seeds are one of the quickest and easiest ways of producing your own high quality Marijuana. The plants remain short and compact, with thick, robust stems. Flowering begins automatically after the third set of true leaves, and the plant will require a further a 48 days to fully grow, flower and mature. Super Skunk feminized autoflowering seeds grow to between 40 cm – 70 cm tall, perfect for indoor Sea-Of-Green growing techniques, and produce approximately 140 grams of pungent Skunk marijuana buds,per square meter either indoors or outside.Expect the classic orange/brown hairs with light green leaves you associate with this strain. Combined with it’s fast flowering, potent and aromatic buds, these Super Skunk Auto seeds are highly recommended. Well-known for their strong, pungent aroma, Super Skunk Autoflower seeds have a THC content of 14%, producing a strong, all-round buzz that’s very relaxing and sociable. A great night-time strain, perfect for enjoying with friends. 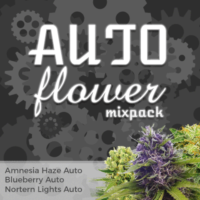 If you love Skunk weed, you will love these Super Skunk Autoflower seeds, they are just a faster version of the original. Indoor growers may need to use odor control, as they reach maturity they really do live up to there reputation with a pungent, skunk aroma. 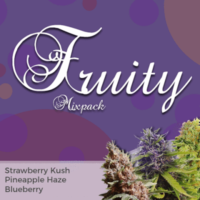 A great strain for a quick harvest of high quality, aromatic Cannabis buds. 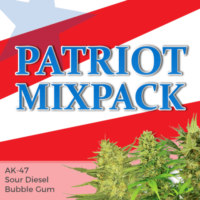 Perfect for first-time growers and outdoor guerrilla set-ups. Grown indoors, Super Skunk autoflowering seeds will require odour control, such as carbon filters, as it does smell quite pungent. Buy Super Skunk autoflower seeds from I Love Growing Marijuana seedbank, available in packs of 5, 10 and 20 feminized seeds, all guaranteed by Robert Bergman himself. An Indica dominant autoflowering hybrid that’s very easy and quick to grow. 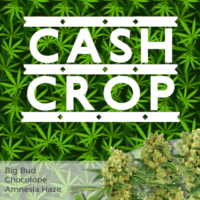 Suitable for indoor and outdoor growing, producing it’s best yields when grown in a Sea-of-Green style. Due to its fast-flowering nature, super-cropping techniques do not work well with this strain, preferring to produce a large, swollen central cola and few short branches. A very strong smelling plant that requires little skill, but good odour control measures in the growing area.